The PANCE is the most feared exam for physician assistant students. After all, in order to become certified, this is a necessary obstacle. It's funny, even those who are calm, cool, and collected throughout PA school start to feel the pressures of this exam. Why do we have so much anxiety about the PANCE? I mean, it's not like the material is new or different. In fact, you have been studying for this moment the second you started the program. And, if you've gotten this far, then you’ve not only studied for 2-3 years, but you've also passed and graduated. Yet, for some reason everyone still tends to stress 10x more about the boards. In this guide, we are going to show you exactly what you need to know to pass the boards and get into practice! Skills related to tasks PAs perform (e.g. 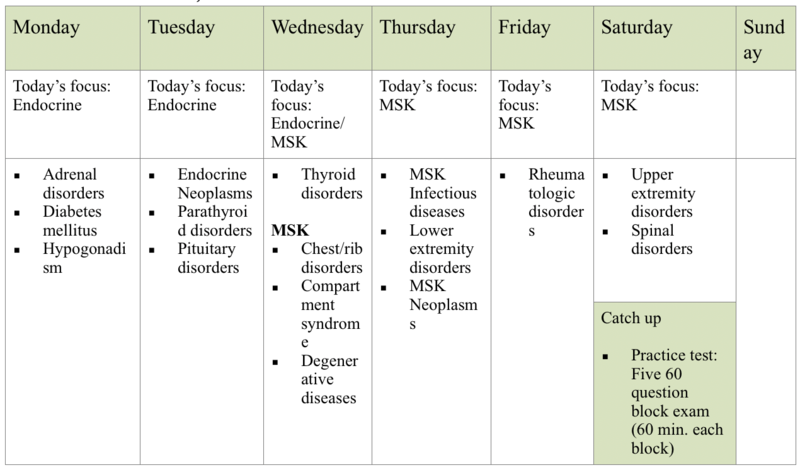 formulating likely diagnoses, clinical interventions, etc). All topics tested are found on the NCCPA’s 2019 PANCE blueprint. 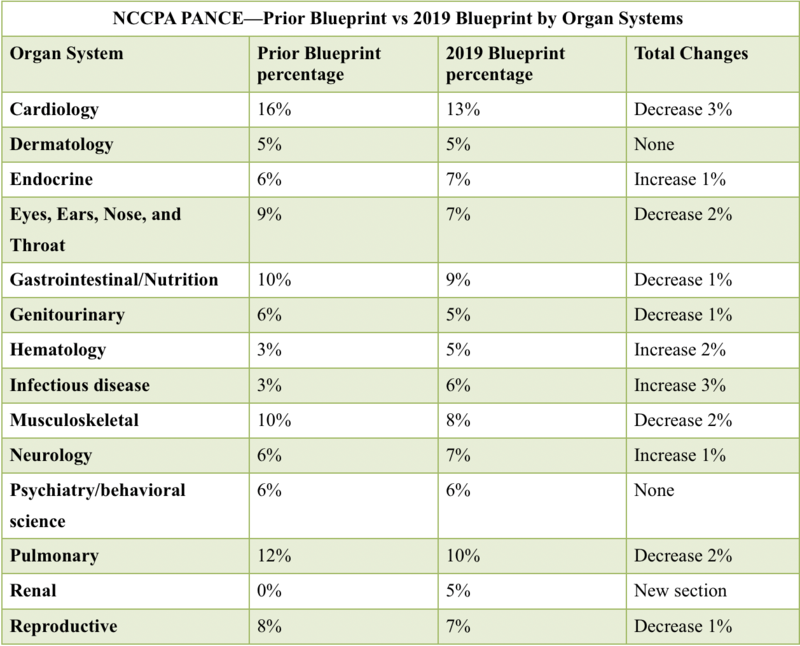 What has changed in the 2019 NCCPA blueprint? 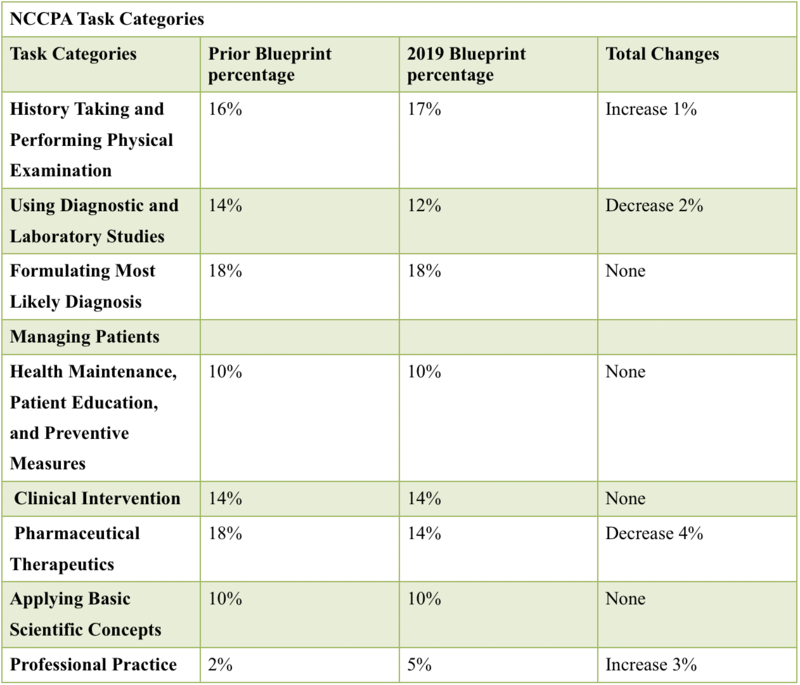 As of 2019, there are changes in the content of the blueprint - creation of new sections and increases or decreases in other sections. Besides this table, I wouldn’t spend too much time overanalyzing the details of what else has changed. Yes, some sections were moved to other organ systems, new titles were given to other sections, etc. But, don’t worry about this too much. Just focus on what really matters: Passing the PANCE! Studying should be guided by the NCCPA PANCE blueprint, which quite literally lists all the topics—categorized by organ systems— that could be on the exam. Do you get the inkling that this blueprint is perhaps the most important study guide ever? Yep! Make sure you have enough time to cover each and every topic. Some systems are more heavily weighted than others (see table above). As such, it is recommended to spend more time on these specific organ systems! Something, most struggle with, is deciding whether to order a CT vs MRI vs ultrasound - when all are considered acceptable. What if they put all three choices on your exam, which will you choose?! What's important here is understanding they won't ask you to choose - so long as they are all considered to be equal in the context of the question. This means you will only be presented with one option. If they give you more than one option, they must give you a scenario, with some sort of contraindication. Let's take the CT scan and pregnancy. On your exam, you will get all the information up front. In real life, you will get the information you ask for. This means they have to tell you something pertinent to make the diagnosis. The only way to do this is to give you associations, classic presentations, triads, etc. Learn these, because it would be unfair to test you on unusual presentations and/or on uncommon scenarios. Syphilis is another great example of this. On exams, syphilis always presents with a painless genital ulcer. But, guess what? In clinical practice, the ulcer can be painful. Again, here lies the difference between exams and real life; you will never see syphilis present this way on your exam… because it would be unfair. Lastly, what do we do about guidelines which aren't clear or with those treatment options that don't have a definitive role? Easy! Don’t worry about them. I know, easier said, than done. Most students obsess over controversy and comb through the literature to try and come up with a definitive answer - when there isn’t one. Certain things, like the management of pulmonary nodules, are largely based on experience, the patient, and comfort of the clinician. But, within this controversial subject, there are things that are clear e.g., nodules over 2 cm are high risk for malignancy so you want to remove these. These are the facts you should focus your attention on. You will not, however, be asked questions on controversial topics. In order for a question to be asked, there needs to be evidence and concrete answers behind it. You will not get questions which have answers that are subjective and/or unclear. We know you've struggled with these concepts, because we've been helping students and clinicians pass their exams and practice better medicine, since 2013. How deep do you need to go with the details? You should study the material enough so that you understand the medicine. Basically, we do not suggest mindless memorization of diseases and conditions. You’ve been through didactic, end of rotation exams, and finals to know that memorization of facts doesn’t really get you anywhere—besides maybe impressing a preceptor. You will remember a lot more of the material, and will be able to access information to answer a difficult question, if you truly understand the disease and/or underlying pathophysiology i.e. knowing the details. The key to success is the ability to make connections to previous knowledge, cases, and patterns. Our suggestion is to learn the material with whatever method works best for you - read, re-write notes, listen to lectures - and then test yourself on the ability to recall that information via questions. With that said, how deep is too deep, regarding details? Many students who are studying for the boards tend to focus on things that don't matter. The minutiae of each disease is not high yield and there's a high likelihood it won't be tested. The problem? As a student, everything seems important! We get countless of emails from students who are unsure how far they need to dig. For example, how much do you really need to know about atrial fibrillation? Are we expected to know how to rate control? Yes. You need to know that beta blockers and the nondihydropyridines (verapamil and diltiazem) are first line. You should probably know that digoxin is occasionally used as an adjunctive medication. But, you most likely don't need to know the mechanism of action for digoxin, in regards to rate control. Now, we are not saying these things aren't important. What we are saying is if you want the best possible chance of passing, then you need to focus your attention on understanding the bread and butter of each disease process. Think of the other details as the icing on the cake. Once you understand the basics of what you are expected to know, then you can dive deeper. That is the time to turn your attention to the minutia. You need to ensure you pass first. Because without passing, you will never get the opportunity to help your patients. It's not a matter of ignoring the latter; its simply a matter of prioritizing. People tend to question this. And, to be honest, it's understandable. Passing the boards is a big deal. It doesn't matter how prepared we are - we somehow manage to trick ourselves into thinking we don't know enough. High yield information, triads, classic presentations, etc. Charcot’s triad, Virchow’s triad, Christmas tree pattern, Koplick spots. Ahh yes, we all remember these from our lectures and textbooks. Classic presentations are extremely important to know—that includes epidemiology (e.g. age, gender) as well as characteristic signs and symptoms. Triads or common descriptors help organize the material nicely to ease learning. Like we said before, the exam has to tell you something pertinent to make the diagnosis. The only way to do this is to give you associations, classic presentations, and triads. But, be wary of studying via rote memorization and word associations! Memorizing word associations for diseases in clinical practice is not realistic and it isn’t realistic for exams either. Most PA schools are structured with didactic, followed by rotations. Once ready to take the PANCE, students have been training under different physicians & PAs for 1-1.5 years. It is important to remember that a lot of clinicians do not practice medicine exactly as textbooks suggest or per evidence-based medicine. Keep this in mind when prepping for the PANCE. When taking studying for the PANCE, be sure you’re answering exactly what that question is asking. For Example, if the question is asking you to select the most appropriate initial test, it is most likely asking you to decide which is the most noninvasive, inexpensive, and sensitive test that will help give you the diagnosis. The other answer choices may be correct and can also give you said diagnosis, but perhaps are more invasive or less sensitive. Focus on the question—most appropriate initial test. Your goal is to select the most correct answer! Exams are black and white - this means there isn't much left open to interpretation. Another way of putting this is - there is always only one best answer. Often times, when students see two seemingly correct answers, an oversight was made. If you’re dealing with treatment options, there was probably a contraindication somewhere in the vignette. If it's a diagnosis question, there was a specific association or risk factor thrown in the patients history, which was missed. Exams follow a predictable pattern and there are only a certain number of questions which will be asked (refer to the questions listed above). The point is, exams follow a predictable pattern. You will be given a list of normal lab values for you to access during the exam. Do not spend time memorizing these values. Always learn the generic medication and not the brand name. The NCCPA isn’t advertising a certain brand. Also, there will be multiple brands for every generic - how will you know which they might use? Generics will always be used. Know them. There technically isn’t any pharmacology or medication section listed on the NCCPA PANCE blueprint, but ensure you review pharmacology with each organ system! 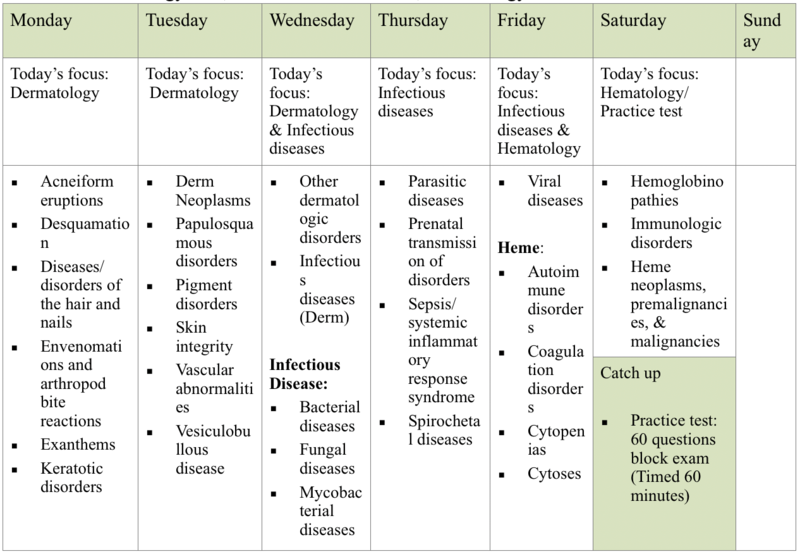 Let’s review study practices and techniques to prepare for the PANCE. We will also share personal experiences and thoughts on popular reviews. Studying for the boards is enough to make our stomachs turn, or for the seasoned PA, to have flash-backs of flash cards, mnemonics, and videos of pathophysiology. But, keep in mind, the goal of a PA program is to produce competent, intelligent and compassionate clinicians. A goal, which is helpful in accomplishing this, is passing the PANCE, or the Physician Assistant National Certifying Exam. So, from the moment you are chosen to attend a program, it’s guaranteed that an admission committee has looked at your GRE scores, work ethic, overall impression and has decided you are a good candidate to help them increase and/or keep their PANCE pass rate high. So take a deep breathe, you got this. As you enter your didactic year of graduate medical education, the foundation of medicine is laid. You learn about disease processes, pathophysiology, treatment, and the clinical management of diseases. You also learn the History and Physical. In the hectic nature of this schedule, you forget that the foundation is being laid for your PANCE passing score. In your second year, you learn how to apply the knowledge you gained during the first year, with living, breathing patients. Attendings give you pearls and the end of rotation exams confirm understanding and competency of key concepts and your ability to translate them to patient care. So, with all of this education, tests, quizzes, and clinical presentations, how do we prepare for “the big one”? Before reviewing different techniques, it’s important to point out one caveat. If you are in PA school, close to graduation, or within a few months of the PANCE, trust your instincts. Whatever you have done thus far has worked and it has worked well. The end of your education is not the time to make drastic changes to your study regimen. For those with a little more time prior to taking the PANCE, play to your strengths. Look over and think about the techniques we discuss, but remember that everyone is different and that each person learns differently. Now, on to some evidence based techniques…. One popular study technique used in graduate medical education is that of spaced repetition, which is a learning technique that incorporates increasing intervals of time between subsequent review of previously learned material. This is a technique in which the study method is a service such as e-mail, quick written summaries of information, and/or quick lecture review of a pertinent topic. This method has been tested by educators as an experiment to teach urology to medical students. Results were promising, showing that spacing time between information and repeating key points was very helpful in the students’ ability to retain and recall information when they were later tested(American Journal of Surgery). Our thoughts on spaced repetition are positive, because it translates well to clinical practice and is proven in the academic setting. In our opinion, this mimics clinical practice because the same concepts are used. For example, lets say a patient presents with a certain set of symptoms that are worrisome for pulmonary embolism i.e. cough, hemoptysis, shortness of breath. But, for some reason, the CT wasn’t ordered and the diagnosis was missed. Well, rest assured you will be tested on this very thing down the road. It may be soon, or it may be in a few months, but regardless, another patient will sit in the exam room with similar symptoms. This time, the clinician will strongly consider pulmonary embolus as a diagnosis, based on the previous encounter. As you can see, there was an interval of time between the previously learned material (prior PE patient) and the current case; this is why spaced repetition most mimics real life situations. Oh yes, the learning does not stop when you pass the PANCE. In fact, it’s really just the beginning. Another particularly helpful method of study includes memory associations, which is the ability to learn and remember the association between two unrelated items. The more associations you can form to something you're trying to learn, the more likely you are to remember it in the future. Memory associations are really student preference, but there are a great deal of mnemonics out there for studying. This is something that is routinely broadcast throughout the academic and clinical setting. Students generally respond fairly well to this type of learning, as it is easy to remember and easy to recall. We are particularly fond of this type of studying, because the sky is really the limit. As I worked through PA school, our study group had students with a broad range of backgrounds. Everyone worked and learned differently, which was an opportunity to try new techniques, and see what worked for me. Mnemonics have always been helpful to bring success on examinations. Even during the PANCE, I found myself reciting memory associations that allowed me to score points. In addition, I would recommend students take memory associations one step further to patients. For example, in school I could never remember the 2nd or 3rd line treatment for acute otitis media. But, my very first otitis media in practice, was with a patient who had a penicillin allergy. After seeing this patient, I never forgot alternative treatment plans for otitis media, as I would always recall this patient in every subsequent patient’s with a penicillin allergy. Test enhanced learning, aka the testing effect or retrieval practice, is a technique in which long term memory is increased when some of the learning is devoted to retrieving the information through testing and proper feedback (feedback is what makes this most important). With this particular method, the goal is to use repetitive testing, to enhance retention of knowledge. This is perhaps the most discussed technique in relation to physician assistant education. Evidence shows that repeated testing increases the relative grasp and command of the material by students. By testing immediately post lecture, the knowledge is still fresh in the student’s mind, and is then affirmed by the testing process. Test enhanced learning, in our opinion, is the most successful technique as it is what physician assistant programs model their success on. By the time one sits to take the PANCE, we have been tested on hundreds of diseases, over and over, in many different ways. For example, in our program, after a weekly lecture, our assignment was to read an article on a specific topic, such as esophageal reflux. We then took an individual quiz, and performed a TBL (team based learning) exercise, where we would work in a group to answer the questions. Our program director would then go through all of the answers, explaining what was right and what was wrong. Moving through the education required to become a physician assistant, we can take the esophageal reflux topic a little further. After being quizzed and lectured upon GERD, we likely took an end of topic examination, where we encountered GERD questions. As we moved forward in our education, we saw patients with GERD in the clinic, and discussed the diagnosis and treatment with a senior physician assistant or attending. This type of repetition is a combination of both spaced repetition and test enhanced learning, as we are intermittently being tested on the topic, both formally and informally, and in slightly different ways. As you will see, there are a variety of different techniques, all designed to improve your success moving forward. There is one resource that is free and offered by your program: The PACKRAT. This way you can compare your progress. The goal is to evaluate strength, deficits, and help programs identify areas of study that need to be improved. For the individual, it is a way to assess progress. Questions are peer reviewed, but have varying difficulty. The PACKRAT allows students to see a raw score, individual performance by content and topic, and then are compared to the national average. The PACKRAT has long been marketed as a predictor of whether a student will pass the PANCE. It is important to keep in mind that the test difficulty varies based on the questions. Think of the PACKRAT as a breath of fresh air. An average to above average score is a way to let students know that everything they are doing, in terms of studying, is working. If anything, it is a way to practice getting used to taking the “exam” on the computer. We have discussed a great deal of information today, much of which leaves you, the student with a lot of food for thought. What are the best techniques for you? For me, there were a few different techniques that worked well. The journey from starting PA school to the PANCE is long. During didactic year, I focused on doing well and passing my exams. As much as I could, I tried not only to memorize facts and figures and most commons, but to continually ask why? I have found in my education that it’s one thing to learn a concept, but to learn why and to apply the concepts to clinical medicine helps retain and solidify the material. At the end of didactic year, taking the PACKRAT helped to affirm that I was well on my way to a successful rotational year. During my clinical year, I tried to remember every patient I saw that day, as I studied in the library. Applying concepts to real patients helped confirm my knowledge. In addition, I used the processes of spaced repetition and test enhanced learning to test my knowledge every few weeks by taking a set of 50 to 100 questions related to whatever topics I had encountered on my rotation. Over all, I studied thousands of questions to prepare myself for the biggest exam in a physician assistant students’ life. I would estimate I saw between 7,000 and 10,000 questions during the last 6 months of my studying. The important distinction is that I did not stop with a correct answer, I read through all of the explanations as to why questions were right and why they were wrong. 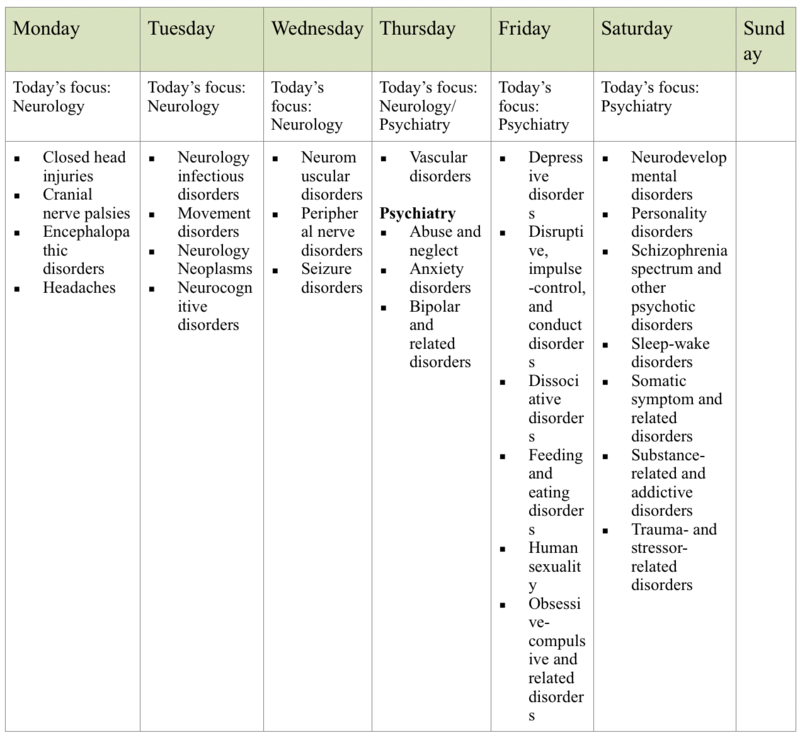 During the year, I encountered other students, residents, and attendings whom provided me with memory associations for difficult disease processes or most commons. This paid big dividends as I moved forward towards prepping for the PANCE. Trust your program, they know how to help you pass the PANCE. Study hard in didactic year, but always ask WHY? Use the packrat to affirm your didactic year knowledge. Be studious and engaged on your rotations. 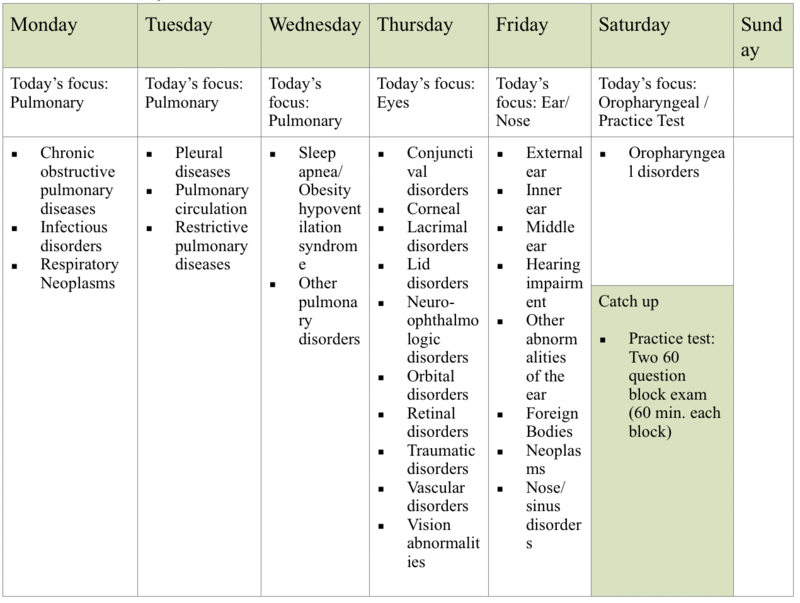 Pick up pearls, mnemonics, and ask others during rotations how they study. Pick a combination of whatever study techniques works well for you and learn to perfect it. Expose yourself to as many review questions as you can. Analyze not only why an answer was correct, but why the other answers were wrong. Use the resources available to you for review. Let’s next dive into resources to use to help you study for the NCCPA PANCE! There are a myriad of different options that students can use. The most important thing to remember is that each and every one of us is different, and one person may not learn the same way as another. One individual may learn best when sitting quietly and reading. The next may succeed in studying with a group of peers bouncing review questions off of one another, and a third person may learn best by listening to podcasts or in a live review program. The key is knowing which serves you best as a student getting ready to take the PANCE, getting through the arduous hours of studying, and then crushing the examination on test day! A very common method students will use to study during their time in physician assistant school, as well as when it comes time to study for the PANCE, is by using review books. Even when I was in physician assistant school you would regularly see copies of what was known as “The Green Book” (A Comprehensive Review for the Certification and Recertification Examinations for Physician Assistants) floating around the program’s hallways. This did not change when it came time to study for the PANCE either. All these books are excellent resources to use if you are looking for a concise source that follows the PANCE blueprint of topics that you must master to be successful on the examination. Additionally, the question and answer books allow you to test your knowledge on these topics. I particularly like this book because it has 303 pre-book questions that are on various medical topics. It gives concise, key point oriented answers which I found very helpful. The book is then a review of all of the diseases on the PANCE, organized by body system. The only qualm I have with this resource is that sometimes the information is a little bare boned, for example: saying that “penicillins are effective versus pneumonia” when the boards might ask a specific drug. Also, I found some areas where I felt some PANCE pearls and commonly tested facts were omitted. I found this book to be well organized and succinct. As a PA student nearing my inevitable dance with the PANCE, I found it very helpful as it has an initial section titled “Overview of the PANCE” which took away some nervousness regarding the set up, logistics, and even a section with tips on how to take a computer based test. I found that the questions were thoughtful, straightforward, and asked a lot of what I felt to be relevant pearls. The questions are broken into “blocks” which made working through them a bit easier. The answer explanations also provided good explanations as to why answers were correct, but also gave good pearls about other conditions. My one concern is that occasionally I encountered a question that was not relevant or was too focused on pathophysiology. Cost is reasonable. Used are available for less than $20. 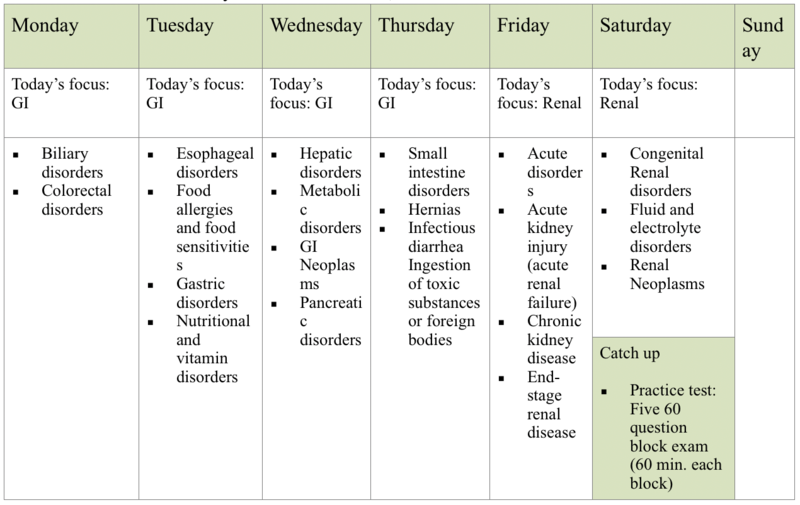 Although this is more focused for medical students, I found this to be very helpful for a variety of reasons. I found this book to be very well organized into topics, had good, concise and clear information. It is also in color, which helped me look at images and EKGs; this helped me understand things much better. The only downside for me is that there aren’t any questions or ways to gain feedback on the knowledge presented. Cost is between $40 and $50. I found these to be particular helpful because they were rotation specific. The set up is a case that is described with a history, physical, and sometimes lab work. The book does an excellent job of keying in on pearls and points commonly tested on the PANCE, and additionally has questions that affirm thought processes and tests to order. Commonly, during my rotations I read this book ing my free time, during lunch, and used it to reaffirm pearls from cases I had encountered in the clinic. Theoretically, these books should have all the information needed, covering all of the topics, in one concise resource for everything that might be tested on the PANCE. By the time a review book gets published, the information and content are typically outdated. Medicine is rapidly evolving, and just by the nature of the beast, there is a high likelihood that there will be newer and more accurate information. There are usually a lack of images for radiologic findings, CT imaging, rashes in the dermatology section, blood smear results for hematology, or pathognomic findings for specific diseases. Can’t ask for help. When studying from a review book, if you have a question, you have no source to ask this question to. Contrast that with online or live review courses, where the lecturer can be contacted through the website or in person at the event. 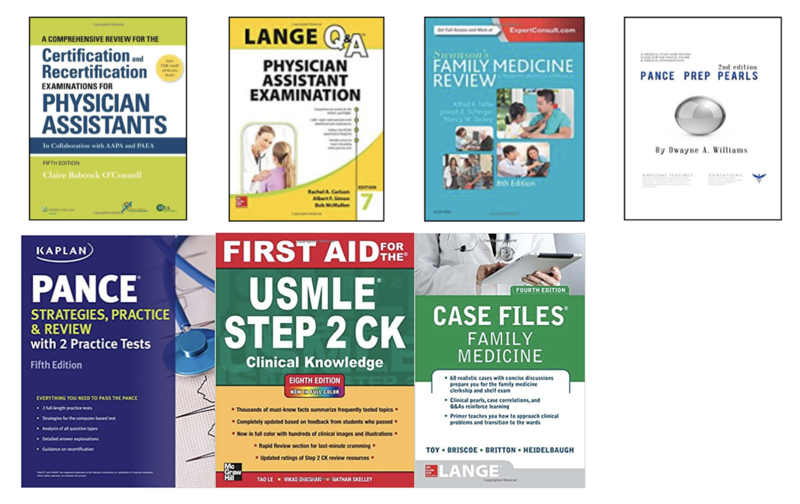 Just like with the review books, there are countless options of online sources to aid in preparation for the PANCE and PANRE. Often these sources will have similar content regarding the review of topics and what you need to know on these topics for the PANCE. However, these websites often time will have associated videos, audio, or lectures as well as the text to read to prepare yourself on each topic. Additionally, some of the online sources for prepping will include a mock examination or question and answer banks. There are also stand-alone websites or programs such as PANCE Master and the Medgeeks Question Bank that provide high yield content in question form - similar in format that you might expect on your upcoming examination. The content will often be continually updated on these sources and websites. So as medicine changes, so should the material you are studying. As mentioned earlier in the article, each and every person might learn differently, and the online platforms aim to cater to this by not only providing text versions of the review content, but additionally videos for the visual learner, and audio recordings for those who may be on the go frequently or for those commuting long distances. Additionally, for those online sources that provide question and answer banks, as well as mock tests, this will often give you detailed information as to where a student strengths and weaknesses are. This information will allow you to make informed decisions on which systems you may need to spend more time on. Lastly, when I was in physician assistant school, I used content from Medgeeks, PANCE Master, and Rosh - the customer service was top notch. If I had a question in regards to something listed in the content or perhaps if I did not understand part of a topic, I could send a simple email, and I would always get a helpful response back from all three of these companies. When compared to the review books, these typically tend to be more expensive. Alternatively, on the other end of the spectrum, these companies may require recurrent charges (monthly fees) for their content. The reviews require access to the internet, which may be another cost for a student to consider. We are all busy! It is the life in which we live in this day and age. The recent data from U.S. Department of Transportation noted that American’s spend right under one hour each day driving or riding in a vehicle (0.96 hours to be exact). Podcasts give healthcare providers, as well as students studying for the PANCE, the opportunity to put this time to good use. There are some wonderful resources regarding podcasts for those who are practicing clinicians and/or those preparing to take the PANCE. The ability to listen on the go and use this time to study for the PANCE. These options will often be free content that can be heard on one’s smartphone. Audio may not be the best way to learn for everyone (it is not the best option for me!). Some students may want or need to take notes while listening, and if you are driving, walking the dog, or doing bicep curls at the gym while listening to a podcast, it can be challenging to do so. If you as a student or clinician are looking for a structured event with lectures on the material tested on the PANCE, then a live review course is the way to go. These courses will bring in lecturers who are experts in the topics being discussed with many years of experience. These courses provide well-organized lectures, printed slides/material, and/or digital files. They may also provide practice examinations and CME. The high yield information will be lectured directly to you. With having a live lecturer, you will have the ability to ask questions directly to the speakers. These events are very pricey. 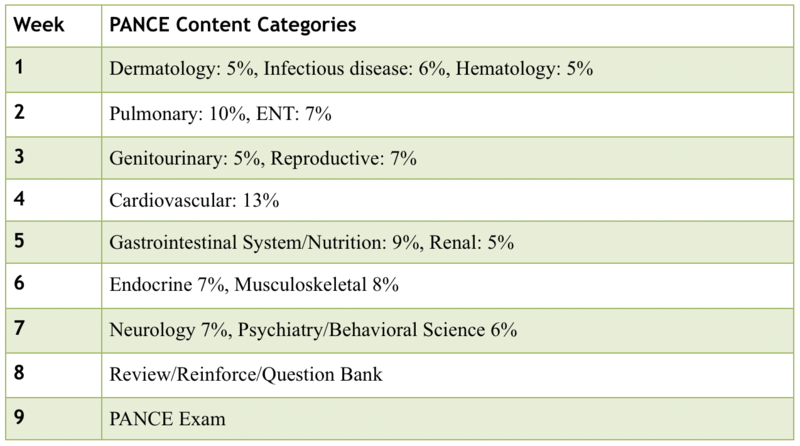 The majority of those in my physician assistant program attended a live PANCE review course. I thought that it was a good review; however, I felt like it was largely a review of things I already knew, coming right out of physician assistant school. I think it would be more beneficial for a practicing clinician, especially if one is practicing in a specialty. These events are normally in large cities. So, you need to account for travel time and lodging as well. In addition to the above resources, I also took advantage of an offer that is available through the NCCPA. This entity also publishes two PANCE practice tests, which are 120 questions in length, and are “mock” exams. These cost $50 each. I purchased one of these during my second year of PA school and found the test itself to be helpful with well written questions, but was displeased to find that I did not get copies of the individual answers or explanations. Instead, one is given a summary based on the categories. For example, one will get feedback on how one performed on urology as a whole, but not on the individual questions. As a student who is learning material, I was not at a stage where I was interested in individual categories, therefore I would recommend against buying these tests. Overall, the path to studying and preparing for the PANCE can be one of many roads traveled. There are a plethora of different options as discussed above. No one single way is the best for every individual student. You need to know what learning style best suits you. Additionally, there is nothing wrong with combining multiple options to create your learning and studying regimen! How soon after graduation should you take the PANCE and when should you start studying? The earliest date you'll be able to test is seven days after your program completion. But, I wouldn’t necessarily look at it this way. 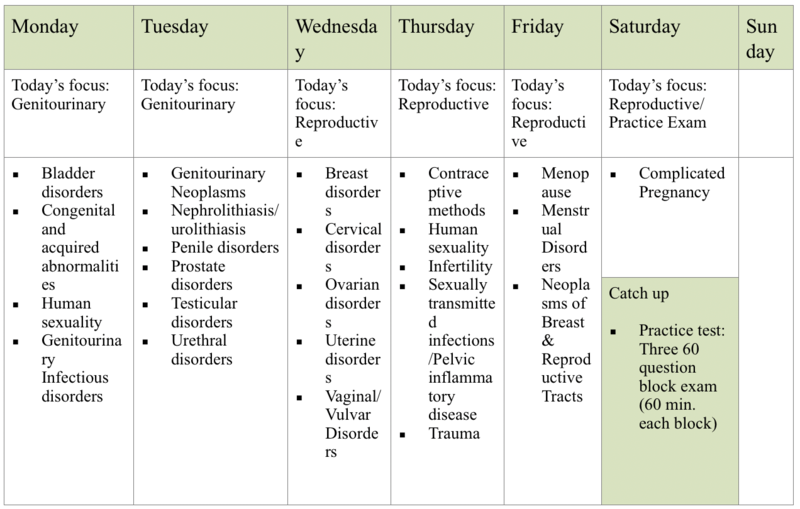 Instead, plan your test date so that you have at least 7-8 weeks to cover all of the PANCE blueprint material. Everyone will be different in his/her approach to the material (some more intense than others), but 7-8 weeks was the sweet spot for me as well as the majority of my classmates. It gives you ample time to plan so you’re not cramming but you’re also not spending so much time test prepping & potentially forgetting material. What Should a Full Day of Studying Look Like? I suggest 7-8 hours of studying a day for 6 days/week. My study days were 8 hours/day, but a lot of days were more like 10 hours/day. Anything more than 10 hours/day and I would personally hit a roadblock & my mind would stray. I would always give myself Sundays off. First off, yes…this is a lot of material in a short amount of time. But, the material isn’t necessarily new—you’ve been reading about & managing a lot of these diseases/conditions while on rotations. Now you must focus on organizing and remembering it well enough for the PANCE & for your future patients. Do not forget the latter! Use the Medgeeks Board Review Course—it was created specifically for the PANCE. Be an active learner and incorporate your own ways to best learn the material. You must test your knowledge of the material with questions. Tip: get into the habit of reading the LAST sentence (the actual question) of the clinical vignette FIRST. This way you know exactly what you’ll be answering. Then read the (often long) clinical vignette. Remember, the vignette must have all the relevant information included for you to correctly answer the question. If they spend time telling you about a sign or symptom (or lack thereof), you bet it is important! Do at the very least 20-30 questions everyday. Write down notes on questions you answered incorrectly. At the end of the week, create a practice exam, and attempt to simulate the testing environment. Time yourself, remove all distractions. This weekly practice test is written in & incorporated in the schedule below so that you won’t forget. Rest Days: The schedule gives you one day off to rest, recover, and start anew the following week. You will have a tough pace of the material all throughout the week. Some days or weeks will feel impossible, but keep going. It is recommended to take short breaks during the long study hours as well. Resting is just as important as getting through the material! Get enough sleep: We really don’t have to explain this one, do we? Week 8: You’ll notice that the last week before the PANCE is light compared to the rest of the weeks. This is done for a reason—so that you’re not burned out once it is time to the take the PANCE. Use this time appropriately—do practice exams, review what you need to review (you know your weaknesses), but also take some time to relax. Do not study 1-2 days before the exam date. We know you’re more than prepared! What to do the Day and Night Before the PANCE? Day before the PANCE: DO NOT STUDY the day before the exam. When prepping for the PANCE, I kept hearing this. At first my thoughts were, “That’s so silly! I want to spend as much time on the material & prep as much as possible.” But, as the weeks went by, I began to realize that studying the day before the exam wouldn’t be much help. I’m happy I took the day off to decompress. I did not read or do anything related to studying the day before—yay Netflix, shopping, and carb-loading! Be sure to hydrate yourself well throughout the day. Night before: Get enough sleep & be well rested for the next day. Set your alarm, tomorrow is the big day! Day of the exam: You’ve been prepping for this exam for the entirety of PA school. Wake up feeling confident and know that you got this! Make sure you eat a large enough breakfast to keep you full and thinking clearly. This isn’t a time to try any new foods—keep it simple! As someone who has dealt with plenty of test anxiety, I’m here to say it is absolutely normal & you are certainly not alone in feeling this way. You will be nervous on the day of the exam and even during the weeks leading up to it. But, the trick is not to let it affect you to the point that it hinders your preparation or clouds your knowledge/judgment. Test anxiety can stem from fear of failure, being in an uncomfortable environment, and feeling unprepared. Recreate the testing environment: Attempt to recreate the exam & environment as much as possible. I knew going in that the PANCE would be taken in a cubicle, with no access to phones, music, snacks, etc. When I studied, I would set a timer for 60-minute intervals and take a short 5-10 min break afterward. Doing well on the exam means having the stamina to last through a 5 hour, 300 question exam! First 1-2 weeks, I practiced with one 60-question block and allotted 60 min to complete it (the same amount of time given on PANCE). Then worked up to two 60 min block, then three 60 min blocks. By week 6, 7,8, I was doing five 60 min practice block exams in one sitting, mimicking the same time constraints as the exam. Like the exam, this meant NO access to phone, music/headphones, snacks, coffee/water during those 60 minute blocks. I also programed the question bank so that it would not show the correct/incorrect answer right away. Once the exam came around, I didn’t feel quite as nervous because I had prepped my mind for the exact environment! Stick to your study plan & reward yourself along the way: A lot of test anxiety comes from feelings of being unprepared. Once you have your study plan, stick to it and continue the routine. It is normal to fall a bit behind here and there—no one is perfect. But, you’ll be less stressed if you keep on task & finish all the topics as scheduled. I would even schedule in catch up periods throughout the week in order to prevent any large deviations from the study plan. Remember to also reward yourself with small breaks throughout the day and week. Break time and your mental health are just as important as studying! How is the PANCE Structured? The PANCE is 5 hours, 300 multiple choice questions. It is divided into 5 sections, each 60 questions with 60 min to complete each block. Once each section of the exam is complete, you cannot go back to that section. Before moving onto the next block, you’ll be prompted on screen if you’d like to take a break. You have a total of 45 min allotted for breaks between blocks. Just know that if you want to take a break & leave the exam room (i.e. go to bathroom, eat something), you have to go through all the security checks again to get back into the testing center. In my testing center, that meant showing ID, going through the fingerprint machine, body scan, emptying pockets. Just take this into consideration! What Should You Expect the Day of the PANCE? Prepare to be at the testing center at least 30 min before the exam. Days before the exam, you may even want to do a practice run on how to get to the testing center. Nothing will bring on more anxiety than logistical errors the day of the PANCE—getting lost, being unable to find the testing center, parking, etc. Plan accordingly! You will check in and go through the testing center security checks. There will be multiple people taking different exams, so don’t worry if you overhear material you’ve never even heard before! Water/coffee, snacks—these are all left in the lockers assigned to you in the testing center. Don’t even bother bringing your notes/books. Most testing centers have a policy that doesn’t allow you to be looking over notes or book inside. What if You Need to Reschedule the Exam? If you wish to reschedule your test date, you must contact Pearson at least 24 BUSINESS HOURS prior to your exam appointment. Since you need at least 24 business hours, our school suggested we schedule the PANCE on a Tuesday, Wednesday, or Thursday, should anything happen and we do need to reschedule. Just something to take into consideration when selecting a date to take the exam! If you try to reschedule an exam less than 24 BUSINESS HOURS prior to your scheduled appointment you will lose your entire fee and will have to reapply and pay for the exam. How Do They Score the PANCE? Correct answers are awarded 1 point, while incorrect answers are awarded 0 points. Total points are added up to produce a raw score, which is then calculated into a proficiency measure. 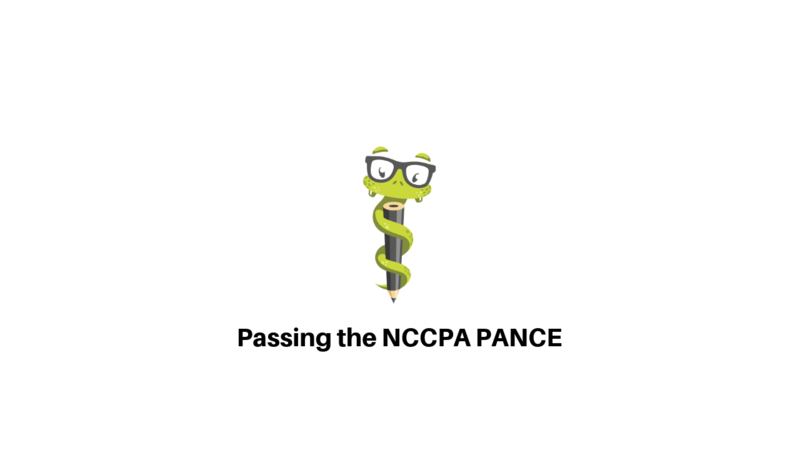 From NCCPA: ……Finally, the proficiency measure is converted to a scaled score so that results can be compared over time and among different groups of examinees. The scale is based on the performance of a reference group (some particular group of examinees who took the exam in the past) whose scores were scaled so that the average proficiency measure was assigned a scaled score of 500 and the standard deviation was established at 100. The minimum reported score is 200, and the maximum reported score is 800. So, you have taken the PANCE. A massive weight has lifted off of your shoulders and off your mind. I still remember taking my PANCE and going on vacation immediately, but in all honesty, I was not fully relaxed until I got my final result. We will be discussing the current national first-time pass rate of test takers, the overall pass rate of test takers, when you will get your test scores, and what happens if you do not pass your examination. What is the National First Time PANCE Pass Rate? The number of first-time exam takers for the PANCE, that pass has been continually increasing each and every year. In 2014 the number of first-time test takers was 7,435. This rose to 7,784 in 2015. In 2016 it bumped up to 8,082. Then 2017 the number of first-time test takers that passed was 8,732. Finally in 2018 the number of first-time exam takers to pass surged to 9,220. As you can see the raw number of first-time passes has continually been increasing, so has the percentage of first-time takers that are passing the PANCE. The percentage of first-time PANCE takers that passed in 2014 was 95 percent, then in 2015 and 2016 it increased to 96 percent, then 97 percent in 2017, and finally 98 percent in 2018. What is the Overall Pass Rate? Next let’s look at the overall pass percentage rate. Just like the number of first-time takers of the PANCE as well as the percent of first-time takers of the PANCE, the overall pass rate percentage has been increasing steadily as well. In 2014 the overall pass rate was 89 percent. This rose to 91 percent in 2015, 93 percent in 2016, furthermore to 95 percent in 2017, and most recently 97 percent in 2018. How Long Does it Take To Get Your Results? The following two weeks after your exam, may be the longest two weeks of your life. That’s right! The average time to hear your results, after finishing the examination, is approximately two weeks. During this time, it is important to relax as best as you can. As I mentioned above, I chose to go on vacation during this time frame. Overall you want to do something other than studying, and attempt to get your mind off the PANCE for a brief time. Once the fateful day arrives, you will be notified via email that your scores have been posted which will lead you to the NCCPA’s website to log in and view your test results. Not only will this page tell you if you have passed or not, but they will allow you to see how well you did on each portion of the PANCE. What Happens if You Fail the PANCE? 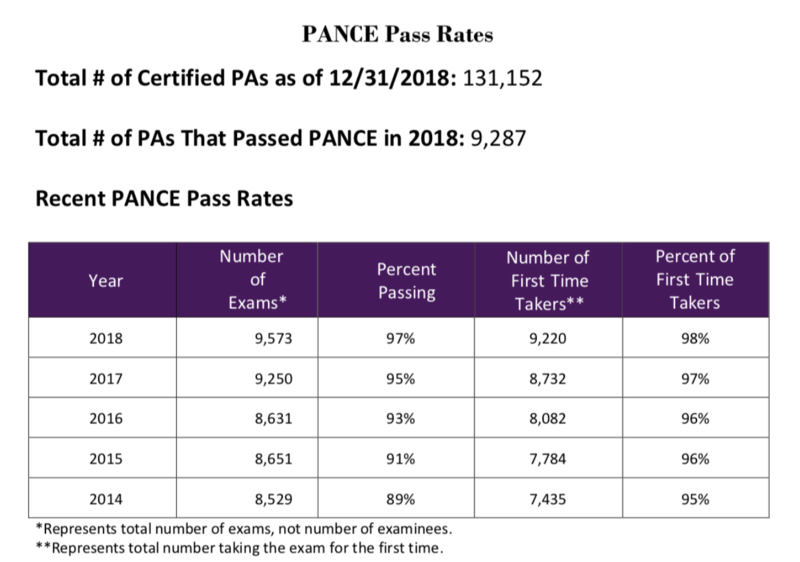 We previously discussed that the number/percentage of first-time takers for the PANCE, that are passing, have increased over the last several years; however, that number is not 100 percent. It may be taboo to talk about this, but it is the elephant in the room. So, what happens if you are one of those who do not pass the PANCE? Unfortunately, some first-time takers or repeat takers of the PANCE do not pass the examination. It happens. Fear, confusion, disappointment, sadness, and shame. You get on social media and see classmates and others posting pictures about passing their examination. You feel as if you are the only one in this situation and you might even feel like a failure. Take a deep breath, and remember, you are not the only one in this position. There have been many more before you who have been in your shoes. When something bad happens to us, such as failing the PANCE, we tend to not share this news publicly. This might give other students who haven’t passed a sense of loneliness. Simply because you do not pass the PANCE, does not make you a failure. This only becomes a failure, if you allow it to become a failure. In other words, this is only a setback, an obstacle, or hindrance that you have to overcome. Remember a setback is only a setup for a comeback. In the grand scheme of things, if one was to not pass the boards, it pushes them back three months. That is a drop in the bucket, when looking at the rest of your life practicing medicine. Three or six months of a delay is nothing when comparing it to thirty, forty, or fifty years as a practicing clinician. Another big psychologic hurdle that some may have to overcome is the fear of inadequacy. Remember that standardized testing does not predict how good or how bad of a clinician one will be. Standardized exams do not correlate to clinical practice. Many students will not be good standardized test takers, but will become phenomenal clinicians. Real life medicine is entirely different than sitting behind a computer and taking an exam. A patient is not going to give you a story or question stem, and then subsequently ask you, “what is the most likely diagnosis that I have?” or “what is the first best test to complete to confirm my diagnosis?”. There is a lot more that goes into practicing medicine, than there is when taking a standardized examination. At the end of the day, what matters is that your patient knows you are going to do everything in your power to make them better. Your patient’s do not care how much you know, until they know how much you care. It can be difficult to figure out where to start when something as tragic as not passing the boards occurs. Remember, it is always darkest before the dawn. Things will tend to get better when you are at your lowest point. Additionally, there are no shortcuts in life, and there will be no shortcuts on your journey to passing the PANCE. It is going to take hard work, and long hours, but it will pay off. One of the most important things you can do is go back and look at the results, and see which sections you struggled with most. This will be helpful in guiding your studies for the next go around. For example, if you were in the 99th percentile in dermatology, then it would not be wise to spend weeks reviewing this subject - move on and study your weak areas. When Can you Retake the PANCE? There is a 90-day waiting period between the time an individual can retake the PANCE. If you need longer to prepare, that is up to the individual, but the bare minimum must be 90 days. The maximum number of times a person can take the PANCE is three times per year. All of which have to be separated by a minimum of 90 days. Those who graduated from an ARC-PA approved physician assistant program on or after January 3, 2003 may take the PANCE for up to six years after completing and graduating from physician assistant school. During this six-year timeframe, the examination may only be taken a maximum of six times. If a student takes the examination six times, or if the six-year time period has elapsed, then the student loses eligibility to sit for PANCE thereafter. At this point, the only way to be eligible to take the PANCE again, is to go graduate from a physician assistant program all over again. "Allow your passion to become your purpose and one day it will become your profession." Medicine will have you second guessing your abilities, it will push your limits, and test your will. I mean, what other profession "pimps" a student? Where else is it acceptable to ask a student questions until they “fail”; to push them as close to the edge as possible? Why do we do this to ourselves? Why do we put up with the sleepless nights, the missed birthdays, and the stress? The answer is because it's so much bigger than you and I. You are sacrificing your life now, so that you can save the lives of others later. We started Medgeeks in 2013. The truth is, it took so much work to get to this point, more than most realize. It was really hard. Because we visualized what could be and the impact it could make in very much the same way you are visualizing your future right now. We often get discouraged if we don't see results right away. But, so long as you are putting in 100% effort - day in and day out - you will succeed. It may take you a little longer than others, but you'll get there. The question then becomes, how do we continuously put in 100% effort? Passion will fuel you when things look bleak, it will help you put in the extra hour when all you want to do is sleep, and it will motivate you to admit one more patient, even after your shift has ended. It's all about passion my friends. Steve jobs said, "People say you have to have a lot of passion for what you're doing and it's totally true. The reason is because it's so hard that if you don't, any rational person would give up. It's really hard and you have to do it over a sustained period of time. So, if you don't really love it, if you're not having fun doing it, then you're going to give up. And that's what happens to most people. If you really look at the ones that ended up, you know, being 'successful' in the eyes of society and the ones that didn't, oftentimes, it's the ones who were successful who loved what they did - so they could persevere, when it got really tough. And the ones that didn't love it quit, because they're sane. So, when it gets tough, remember why you started. Remember your passion, and remember all those who you'll end up helping along the way. Wishing you the best and thank you for allowing us to help take your medical knowledge to the next level! Our goal is to change the way you learn medicine by providing the best medical material to help you get through school, the boards, and to help you excel in clinical practice.